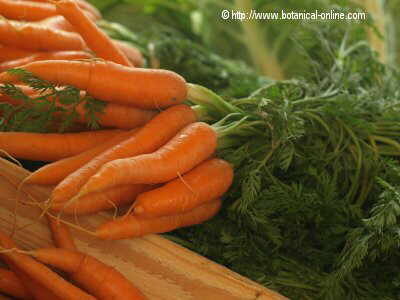 Carotenoids are a very important group of organic pigments with antioxidant functions. They are those carotenoids with a reddish-orange color. Beta carotene: Beta carotenes are precursors of vitamin A. It is a plant pigment that, once ingested, it is converted in the liver and small intestine in vitamin A. It is an antioxidant component that favors the non-appearance of cancer, especially lung, mouth and stomach cancers. It has also been shown to prevent the occurrence of heart disease. Alpha-carotene: With more outstanding properties as an antioxidant than beta-carotene, appears in the same foods but in a lesser proportion. Alfacarotene is believed to have protective properties against cervical cancer. It is found in carrots, corn, mandarins, oranges, melons, and raspberries. Cryptoxanthin: With more outstanding properties as an antioxidant than beta-carotene, appears in the same foods, though in less proportion. Like betacarotenes, it is a precursor of vitamin A. Cauliflower is the richest vegetable in this type of carotene. They are those carotenoids that have a yellow and brown color. Lutein: fat-soluble yellowish pigment that appears on algae, bacteria and higher plants. Its role would be to protect the plant from solar radiation. This same property is effective to protect the human retina of the sun’s ultraviolet radiation making it a very suitable component for people with vision problems, glaucoma or cataracts. Blueberries, plums, aronia and blackcurrants are sources rich in lutein. (More information).